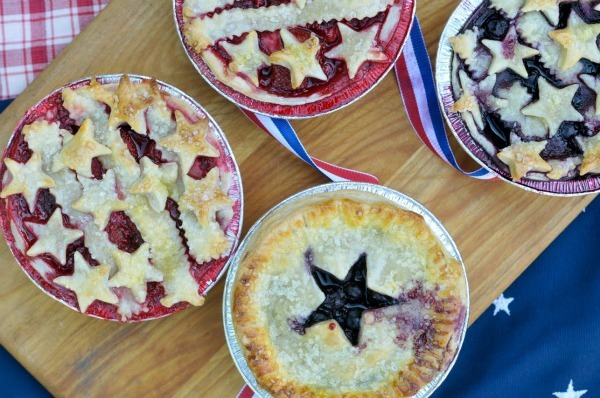 Hot dogs, burgers, potato salad, chips, watermelon and pie are staples of any 4th of July picnic, and AHRN.com has some great recipe twists along with ideas to jazz up your décor. 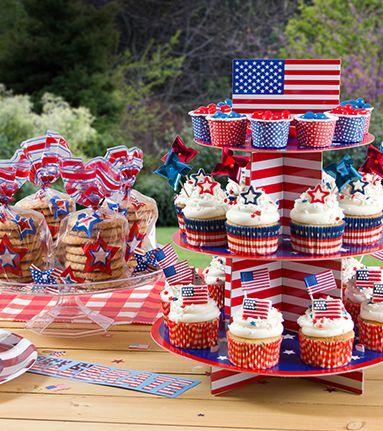 The Fourth of July conjurs up traditions that bring us all together as we take time off to enjoy: our flag, a home town parade, fireworks, and a picnic or BBQ shared with family and friends. While the first few may be provided, you will bring the picnic! Why not have these first up to set the stage? 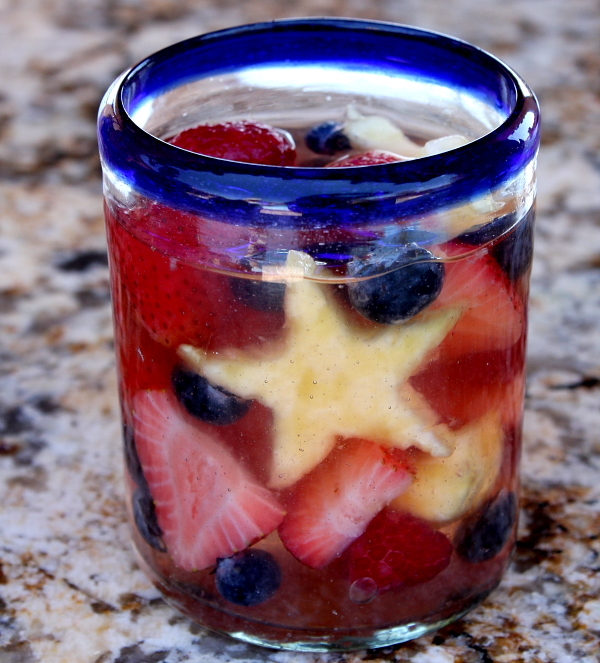 Especially when the libation is this awesome Red White and Blue Sangria! The star fruit rocks this recipe from RecipeGirl.com when added to blueberries and strawberries! If starfruit is not available, you can cut watermelon into stars and just add blueberries for the same effect! Make these without alcohol and add in ginger ale for the kids. Or try refreshing Watermelon Margaritas from MyRecipe.com. Just as yummy as it sounds. Both of these drinks will be surefire hits, especially on a hot summer afternoon! 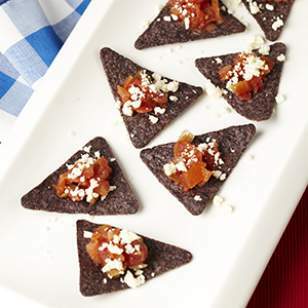 Make healthy, individual Red, White and Blue Corn Chip Bites on a white plate with this recipe from EatingWell.com. Be prepared for them to disappear! Too much work? You can always open a jar of salsa and put it on the table with a bag of chips – but it’s just as easy to make it special by choosing from all the great flavors out there (organic, extra spicy or sweet) like Newman’s Own mango or pineapple. Cut up an avocado to mix in and you have a bit of that guac taste without any work. Your bag can be blue corn chips… or go with Hint O Lime by Tostitos for a real treat! Try a twist on beef franks and grill one of the many gourmet dogs offered in the market. You can go with plain regular chicken or turkey, or you can choose from Feta-Apple, spicy jalapeno, or many more options. Or go to a butcher for freshly made sausage and bratwurst. Have a hot dog bar with all the toppings – the choices are almost endless! 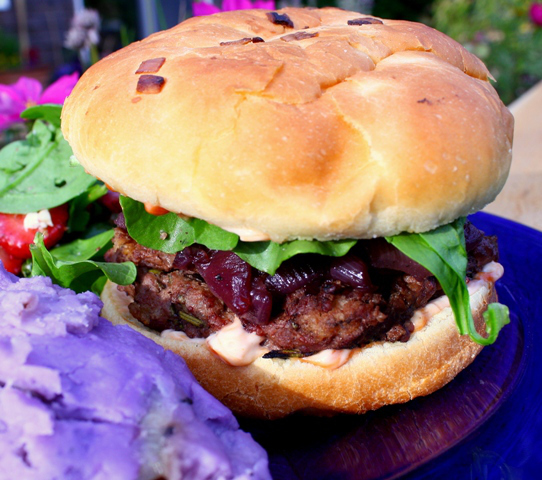 Speaking of a twist, bite into the amazing Red Wine and Blue All American Burger from GoLightlyGourmet.com! Another unique take on this classic: the Brisket Burger from MyRecipes.com,which claims it’s so good on it’s own, there’s no need for condiments. I find that with incredibly flavorful Buffalo burgers as well, which you can now buy at most name grocery stores. Just ask your butcher. 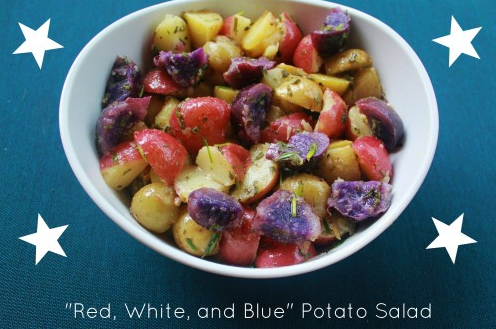 Up your potato salad game by using Red White and Blue new potatoes – those small golden potatoes (which taste like they were grown with butter), Red Bliss and those blueish purple potatoes. Use with your favorite recipe – whether you like lots of mayo, chives, blue cheese, hard boiled egg whites, celery or pimentos (for more red) – or try this light recipe for “Red, White and Blue” Potato Salad with a little mustard for tang from Runpretty.com. Serve it like they did on a white – or red – plate! 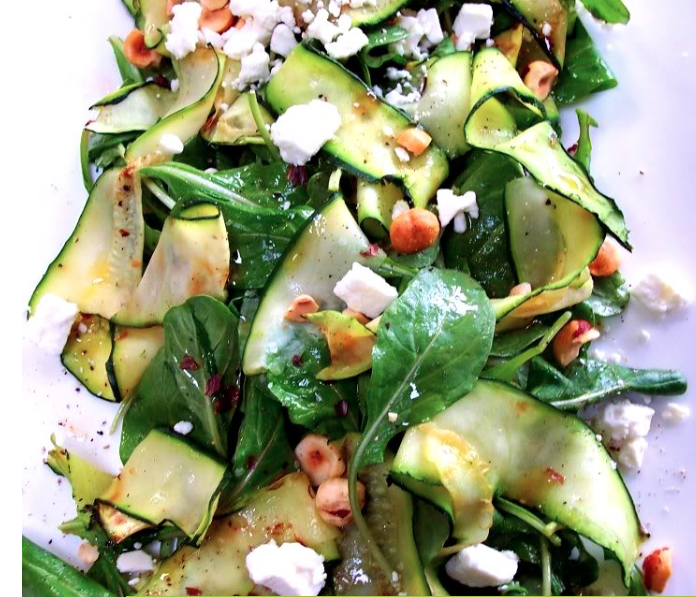 Zucchini Ribbon Salad – a light, healthy YUMMY take on salad that we bet will be devoured – recipe from prouditaliancook.com. This calls for grilling – you can broil instead at home and bring to a picnic, or make the salad and bring the raw strips to a BBQ to put on the grill and toss right before serving for that hot/crisp combo. Wow the crowd when you place one or more of these Summer Berry Pies on the table! TheUrbanBaker.com was inspired by a cover of a magazine and adapted the recipes. And there are ALWAYS cupcakes – so easy to make. Let the kids decorate by providing pre-made white frosting and red and blue frosting pens and sprinkles and flags or stars on toothpicks. You can order sparklers online (if it’s legal in your state) and add them when you serve for extra “flash”. With this kind of menu, you really only need to buy a solid red, white or blue table cloth (pick them up at the grocery or party supply store with paper on top, plastic underneath, or all plastic for spills for $1.99-4.99 each!) and add some themed napkins or colored plastic flatware and you’re done. 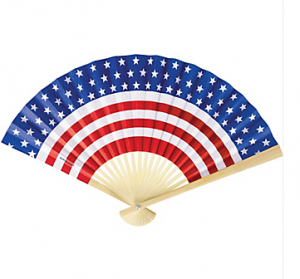 But there are some fun party favors you can pick up locally or order from PartyCity.com. Star shaped sunglasses, individual bubble bottles, luminous jewelry, pinwheels for the kids and fans for the ladies (and more) will bring the celebration to the next level for kids and adults alike. Most cost around a buck each. Go rustic by using a quilt for a table cloth and adding some of the DIY touches that create big visual payoffs like red, white and blue bandana banners, brown paper bunting, and ball jar votive lanterns! Find out the how-to’s on our Easy Breezy Summer Decor blog! Enjoy! If only I was hosting a bbq! The menu you provided is absolutely perfect. I will, however, be testing the recipe for sangria. Cheers! We’re glad you like them Deb! Thanks for writing.